Nightmare is based on The Caterpillar in the original Alice in Wonderland, but is usually seen when Alice is sleeping. Later, he comes to the clocktower with a resident of Clover. He is the one who allowed Peter to bring Alice into Wonderland. He calls himself a 'Demon', claiming he is the embodiment of bad dreams. He interacts mostly with Alice, but also appears before Peter and Julius as well. It appears he along with Peter knows why Alice was sent to their world. He also claims to love her. He is sickly in the books and is seen coughing up blood, but hates doctors and injections. 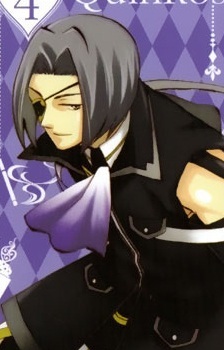 He wears an eye patch for unmentioned reasons and seems to not have any weapon. In the second game Clover no Kuni, he revealed to be the head of the Clover Tower.